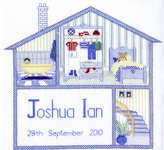 A pretty birth record of a sleeping baby in a crib, personalised with his name, date of birth and weight and length at birth. The kit has a large scale black and white chart, printed 10 stitches to 10 centimetres. 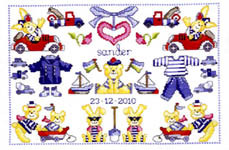 The pattern is worked in cross stitch and backstitch using 14 shades of stranded cottons. The stitch count is 61 by 160.
pair brass 12 centimetre bell pull hangers.